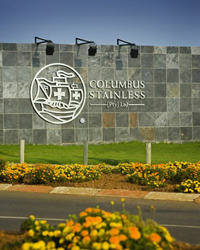 Columbus Stainless, part of the Acerinox Group of companies, is the only stainless steel mill in Africa. Based in Mpumalanga, South Africa, we produce austenitic stainless steel, ferritic stainless steel and duplex stainless in plate, sheet, coil and strip. We are a major stainless steel supplier into Africa and internationally. We manufacture the most popular grades of stainless steel, such as austenitic grades 304 stainless and 316, ferritic grades 430, 444 and 441, as well as 3CR12 – a corrosion resisting steel that we developed for improved weld-ability and low cost applications. We also supply duplex stainless steel grades 2205 and 2304 in sheet and coil. Our production facility offers a range of surface finishes, from BA, polished, 2B (mill finish), No.1 as well as black. Details on specific finishes are available on our stainless finishes page. This material is available in widths of 1.5m and 1.25 m, as well as narrower widths, depending on clients specific needs. Slit coil is also available on demand. We have a comprehensive stainless steel suppliers network throughout the world who are able to assist with your specific requirements. For details on your nearest stainless supplier, please visit our stainless sales section. Dedicated to the highest stainless steel quality in all flat products. The quest for new and innovative mill processes. Safety is a way of life at Columbus Stainless.